Ever walk around convinced that you're absolutely tapped out of creative juice - ya know, unimaginative, uninspired, man there's nothing new under the sun type of thing. [raising both hands me me me!] Then I see something like this, Jaime Narváez totally reinventing one of the most basic objects around - the notebook. 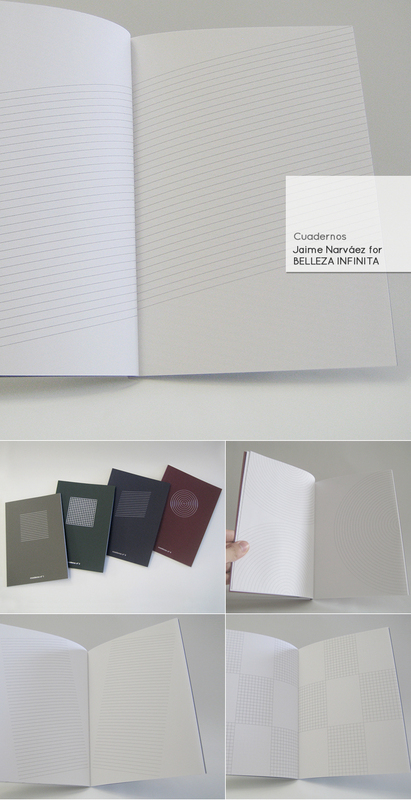 I emailed Belleza Infinita to inquire about the notebooks. They're still working on their online shop but if you're interested in purchasing these notebooks and you're in the U.S., you can email them at tienda@bellezainfinita.org and pay with Paypal. If you don't have Paypal they'll be happy to discuss other options. It's about 29EUR/~41USD (5,70 euro x 4 notebooks + 6,20 euro shipping). The notebooks are really neat!!! !